Ronald Halder, a dentist turned nature enthusiast and pioneer bird-watcher, has come up with a CD that contains delightful songs of the birds of Bangladesh. His compilation let the public get a taste of a rare treat. Spotting birds and identifying them is a thing only for the bird-watchers, this idea no longer applies. As all the species of our unique flora and fauna are seeing a drastic reduction in number, nature enthusiasts are becoming a major exponent in forming a voice in favour of conservation. Ronald Halder too thinks that bird-watching is not merely a hobby, he considers it to be a vehicle that may lead to an awareness about forest depletion and conservation. A record of nature is only meaningful when it is done to affect a change in our attitude towards nature. The album of birdcalls that Ronald recorded does that and more. 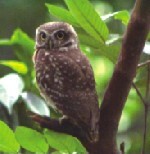 It helps identify the birds of Bangladesh. It took Ronald Halder ten long years to record the calls of two hundred species of birds. He roamed about the land and sifted through its last remaining forests with his sound appliance in hand: "the thousand dollar instrument" that traps the sound of nature. Yet in 10 years he could only furnish a list of 150 calls, as a lot of the calls still remain to be identified. It is not that Ronald is at a loss about the origin of these collected chirps, twits, babbles and warbles, it is just that there are birds whose three calls are markedly different from one another. He needs to be sure of the origin of each call before he catalogs them. "I am still trying to identify birds of whose calls I have already recorded. As calls are multiple, they can sometimes be misleading," says Ronald, who at the insistence of his bird-watching buddy, Enam Talukdar, mimics the call of the shyma bird. Ronald's sparingly furnished apartment seems to echo the tasteful proclivities of its owner, still, In its midst, the birdsong seems unreal. And the imitator, who almost mimics the call, soon gives up and declares, "you need a dry mouth for this". He goes on to explain how each bird has three different calls to crow about, one, which is the "routine call", the other that is referred to as "alarm call" and lastly the one that is the "mating call". As for the shyma, Ronald has recorded 10 different calls belonging to 10 different variants of the same species. They were all included in the CD. There are many birds that are difficult to spot as they have the habit of remaining out of sight. The best way to identify them is through their calls. And Roland Halder has opened up a new vista by providing a body of knowledge which brings to the forth the vast reserve of birds in Bangladesh. 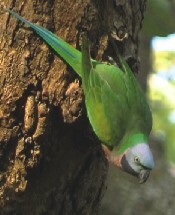 "I had recorded two calls of the barbet back in 1998 and could only identify one call and the other remained a mystery. It was not until 2002 that the mystery was solved," says Ronald, whose passion for birds paved the way for many other bird and nature enthusiasts. Ronald is constantly in the lookout for new species, his ears are eternally cocked up to hear new calls, and the eyes are always in search of the birds. He progresses by matching the voice with the owner of the voice. "It is a time consuming work, but I thoroughly enjoyed my last twelve years," declares Ronald who believes that there are about 650 species living in Bangladesh, which he dreads are fast disappearing. The CD that was inaugurated on 15 April took two years to edit. Roland could not leave any room for error or even bad recording. "Editing is a tedious job", says its maker. "To aim for the best you need to muster clinical precision," adds his fellow enthusiast Enam. 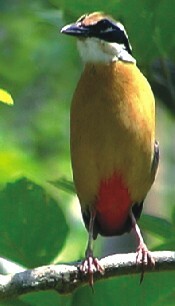 The CD is titled "A sound guide to the Birds of Bangladesh", and is a collection of 99 calls of birds. Multiple calls of the same bird have been diligently marked out in the CD. "I thought I was going to put hundred and fifty calls, I worked towards meeting that goal, but later I found out that one CD could only provide the space for 99 calls," says Ronald for whom it is the first step in publication. This album is the first volume of his collections. More are in the making. For Ronald, 1985 was a decisive year, it was when, as a member of the British based Oriental Bird Club, he picked up his first binocular and started the hobby of bird watching. The hobby soon turned into a serious pursuit. It was not until 1993 that he ventured into recording of birdsong. "In the first attempt, I used a common stereo microphone instead of a parabolic one that suited my purpose. I tied it to a bamboo and the result certainly was shoddy. But it ignited my passion so much that I came up with my own version of a parabolic microphone," relates Ronald. He contrived a concoction putting an electrode condenser microphone into a melamine teacup. With this self-generated equipment he achieved improved recording. It fed on his ambition. The first professional parabolic microphone that came his way was a gift from an American friend Dan Gibson, who is a friend. "It was a cumbersome equipment that proved to be a very, very useful tool. Quality recording became possible only after I received this appliance," says Ronald, who always travels to forests with companions who share his enthusiasm for nature. Roland is known to the string of fellow enthusiasts who became his close associates and friends over the years as Roni da. And Ronaldo aka Roni da harks back to his early shenanigans with his finally acquired thousand dollar light, state of the art equipment in hand. He remembers how in the late nineties he and his peers used to wander through the woods to record the hoots of owls. "We used to plan ahead to make it convenient for all who tagged along, every trip had to be a well coordinated one, it still is," says Enam, who accompanied Ronald in many occasions. Ronald remembers how he and his companions used to trudge the forest in search of owls. "In 1998 we went to Modhupur forest where I recorded owls' calls that features in the CD," says Ronald. "Calls plays a significant part in our country life and even our folklore. I remember how my nani (grandmother) used to ask to cook for guests who might turn up after hearing the athith (guest) bird sing, which was taken as an announcement for the arrival of guests," Ronald adds. Ronald grew up in Faridpur, where his grandfather worked in the missionary school. He remembers the swamp forest that used to hide in it the ample reserve of birds that made the child Ronald curious about nature. "It started at an early age, the forests and vegetation made all the difference. We grew up in proximity with nature," says Ronald. The forest of his home district disappeared long ago, along with it the bird population. Habitat loss is the main reason. Ronald's concern for loss of species, of which little is known to the somewhat eco-ignorant urban Bangladeshis, a genuine one. He wants to break the slumber. While many are simply oblivious to the effect of losing the natural diversity Ronald's endeavour is an alarm call of his own composition. As a photographer Ronald has recorded the treasures that are categorically being effaced from the face of the earth, and he is not sitting on his success in working with birds only. His documentary in the year 2000 on the Shatchory forest bordering the southern part of Sylhet is a sad testimony of how the forest is disappearing as humans are transgressing the domain of animals and birds. "The forestation programme that the forest department has taken up is a farce, as birds and animals need natural forest to make their home. Even a bird like the woodpecker can only turn a thirty year old tree into its nest," Enam testifies. The old and the natural forest is the only home of the dwindling bird and animal population of Bangladesh, this is a fact that the government is taking years to wake up to. Ronald also did a documentary on the Tangua Haor in Shunamganj. This helped shape a voice that made the government to take up some measures. The CD of Ronald is not just a compilation to savour what he himself refers to as "exquisite musical compositions of nature". It serves to soothe the ears, which is plus in itself. But it is also a wake up call for many who never really thought that human aggression has such potential to usher in a natural calamity that results from deforestation.